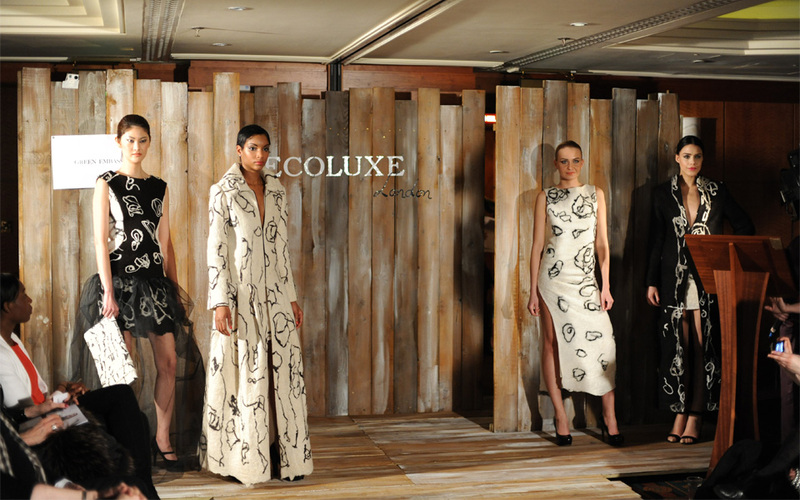 I promised to tell you all about Ecoluxe London, which featured our very own Green Embassy! It was a whirlwind of a trip but I’m feeling on top of the world about the future of Green Embassy and eco-fashion in general. Back to the show…there’s nothing quite like the buzz of a fashion event – and seeing your garments on the international catwalk with a gallery packed with media and press members (I was the first designer of the show). It was fascinating to see so many designers from all over the world sharing a passion for sustainable fashion. I loved the enormous variety in collections, with fantastic ideas on everything from recycled materials to gorgeous high-end fashion. The pieces I showed from my Regeneration series ignited much interest, especially from fashion and blog writers. I suppose my work stood out from the crowd as it was the only certified organic label combined with a strong artistic approach. I was even asked to start producing garments for men and children! On 16 March, I’m back on a plane and heading OS again, this time to Vancouver Fashion Week. I’m excited to be showing pieces from my latest Earth collection (check out the gallery here), which is all about earthy tones and biomorphic lines, which is another way of saying organic shapes inspired by nature. Stay tuned, and thanks so much for your continuing support.